Anne Herzberg studied Egyptology at Freie Universität Berlin. While studying she collaborated with diverse research projects, such as the “Medienuniversum Assuan” project by the Deutsches Archäologisches Institut in Cairo and the field season of the “Asyut Project” directed by the universities of Mainz, Berlin and Sohag. Before starting a fellowship at Topoi, she was research assistant within the project “Strukturen und Transformationen des Wortschatzes der ägyptischen Sprache” by the Sächsische Akademie der Wissenschaften zu Leipzig. 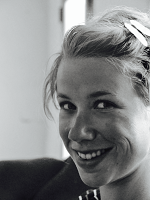 Within Topoi`s research group (C-1) Deixis and Frames of Reference and BerGSAS research programme “Ancient Languages and Texts” (ALT), Anne Herzberg works on her dissertation which focuses on ancient textual sources of Egypt`s ancient capital Memphis.